Drawing of the fatal wounding of Lord Robert Manners, Conrad Martin Metz, 1782, British Museum. 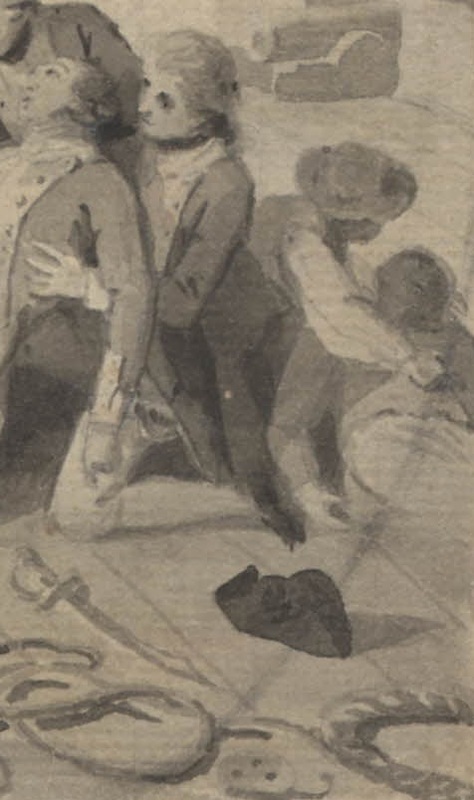 Metz has illustrated an event that I have addressed in the past: the death of Lord Robert Manners. As I mentioned in the previous post, Manners' death was a gruesome one, with the amputation of one leg and onset of lockjaw. Metz is in good company with cleaning up the brutality of war for a popular audience seeking glorification. 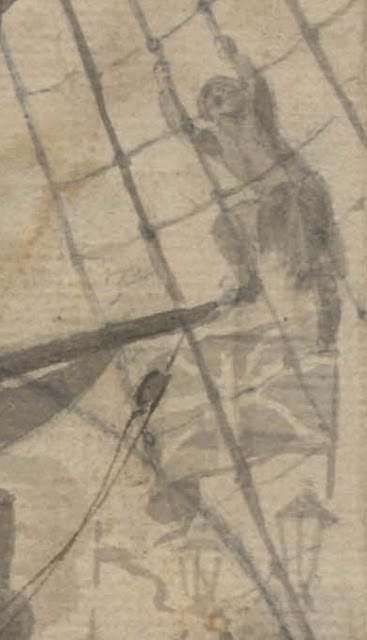 Unfortunately for us, the drawing is a sketch with few details, an all of the common sailors are relegated to the background as mere shadows over the main event. 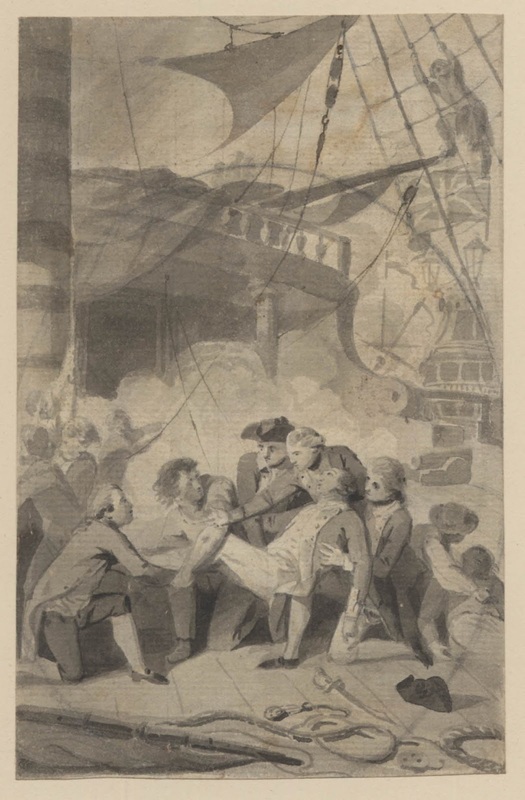 Laying beside Manners, who is attended by several officers, a lone sailor lies dying on the deck. He is held by his mate, who comforts him in his final moments. 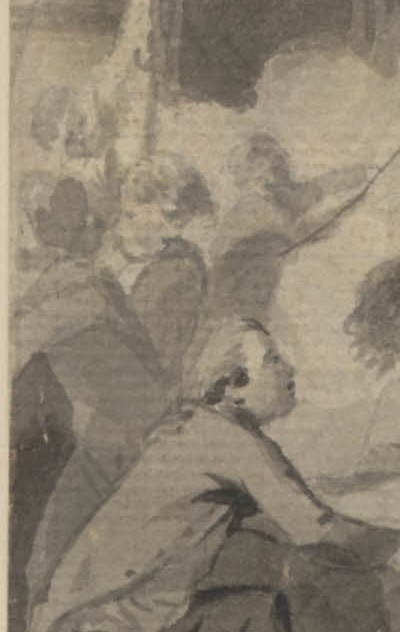 They both wear jackets, and it appears the dying sailor wears a pair of trousers, but the details are too sketchy to be certain. All I can say with certainty is that his mate wears a wide brimmed round hat with somewhat cylindrical crown. Even less can be said about the deckhands to the left. They wear jackets and what appear to be trousers, but are hatless. Climbing the ratlines is a brave tar who clutches the shrouds to hoist himself aloft. He wears a jacket that ends at the waist or is tucked into his petticoat trousers/slops. Atop his head is either a cap or round hat with short brim. 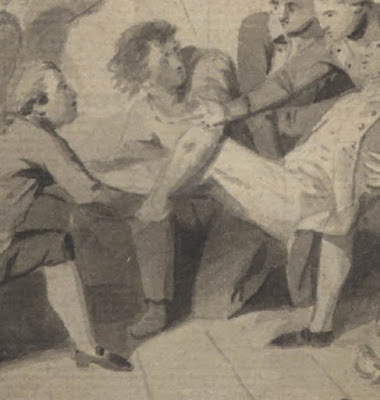 Lifting Manners by his wounded legs, a tar is alone among the officers in helping to take his lordship from the danger of battle. His shirtsleeves are rolled up past his elbows, and his close fitting trousers end at the ankle.